I'm sharing one of my favorite Christmas-time recipes for our Family Recipe Friday this week. 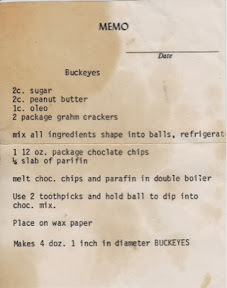 For many years of making my selection of holiday munchies Buckeyes have been on the to-do list. I am sure that a family member or friend passed this one along to me but I've long go forgotten who that was. The recipe's condition, typed on a butter-soaked piece of desk pad paper, makes me believe it's another cooking treasure shared by my longtime office friend, Donna. They were all great ones. And these Buckeyes are no exception. They never last too long when the cookie tray goes out on the table. Enjoy!